A Kingdom Year | Reading N. T. Wright's "The Kingdom New Testament"
Find the reading schedule on the “Reading Plan” page in the upper right hand corner. Construct a plan that works for you. Use any translation, but try out a new one. I like to read during the work week and take the weekends off for family and rest. Read your chapter for the day and then take a look at the short thoughts on the chapter posted here. You can find those by clicking on the present month in the “Archives” section in the left-hand sidebar. Then scroll down to the correct chapter. Sorry, blog posts naturally pile on top of each other. You will starting from the bottom and work up. You can find what others are saying this year by looking at the “Recent Comments” section in the left-hand sidebar. You will be taken to that comment by clicking on the link. Join in! Share your reflections as you read. You will find you are more engaged and have an easier time sticking with it. May our exercise of communal reading be a blessing to you this year as we all grow into the image of Jesus. You have one man’s attempt to stay disciplined as he reads closely the New Testament in 2012. 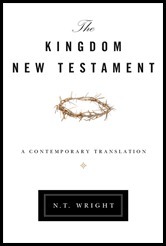 I am reading N. T. Wright’s translation The Kingdom New Testament, but pick up any version of the New Testament you wish and join the conversation. I’m posting the verses that speak to me most poignantly each day; make a comment and include your favorite verses as well. One chapter a day, five days a week, every full week of the year. Really, that is a not a lot of reading. But I have a whole string of years where I couldn’t even muster the fortitude to be that disciplined. Maybe you do too. There seems to be something about reading the Bible that creates a challenge even for the most ardent readers. Yet we did it. And we can be thankful for our seemingly small feat. I know there are big, monumental experiences that shape us in significant ways. But more often than not I find we are formed as humans by our little habits, small victories, excusable vices, short lines in sand, and tiny changes. As far as blogging is concerned, I don’t know yet what next year brings. I will keep my personal, periodic blog going, but this blog comes to an end today, though all posts will stay up and accessible and the comments will stay open. This is now two consecutive years I have written a blog of this sort — two years ago with the Qur’an and this past year with the New Testament. I do not have plans to undertake a project like this for this upcoming year. I have discerned that it is best for me to spend time with physical and domestic health instead. I am drawn to The Message again, the translation I almost used this year, before N. T. Wright published The Kingdom New Testament, his interesting but not significantly different translation. I hope to keep reading on the same schedule but without the writing. Maybe one of you will find value in a writing discipline like this and invite us to join you next year? As you might expect from a teacher, I would like to end with a question. Not all of you have wanted to post comments this year and that has been fine. Do consider posting on this one. What have you learned from a year spent reading God’s Word to the Church? I share three reflections I have had several times this year. I look forward to your thoughts as well. 1. For many of us, there is no better spiritual practice than reading the Bible. Spiritually, people are wired differently. Some are shaped strongly my worshipful experiences. Some have been turned into who they are by fervent, honest prayer. Others become different people through service to those they love and those in need. For many, though, the regular practice of Bible reading is the number one shaping influence in their spiritual growth. This is where the Gospel, in its many forms, speaks good news into the vagaries of our life. This is where we are confronted by words that have been read — spoken, really — and therefore cannot be ignored. This is where our minds of flesh are turned spiritual. Almost without exclusion, those I respect the most spiritually all have one thing in common: they read their Bibles. In a million different ways. But they read. And I want to be one of these same people, so I read. When one truly gives him- or herself to the words of the Bible as we have done this year, we are not left the same person. Sometimes, like echoes bouncing around in the chasms of our hearts and minds, those words hit us months later, but the word of God is “alive and active” (Hebrews 4:12). These words do not “return void” (Isaiah 55:11). 2. The Bible is always best understood when read and interpreted together. Blogs have long been cited as tools that have overly-democritized the marketplace of ideas. Whether you are 8 or 80, you can create a blog and post your ideas. Then search engines put all search results side by side by topic, not knowledge or research or experience or anything else. That is why the best blogs always have a robust community of readers and comment-makers so as to raise the discussion past the opinions of the one author. That is what I was hoping we could produce here. Likewise, Protestants (as most of us reading this blog are) have always made much-ado about the “priesthood of all believers” and the importance of the Bible. Put them together and we all feel like we can read the Bible by ourselves and our personal interpretations have equal authority. For sure, all should read their Bibles and all perspectives should be considered, but the interpretations that are hammered out in groups of people are almost always better than what individuals come up with themselves. That is the value of Bible classes in church contexts. That is why we read other people’s books. That is why education has (until lately) always been a communal undertaking. I am extremely thankful to all of you who have taken the time to read my posts. I am even more thankful to those of you who took time to comment and ask questions and bring up alternate viewpoints (and not all of this was done on this blog; sometimes it was at school or church). I have learned from you, and where “iron has sharpened iron” our understanding of the Bible has become that much better. From here on out, I always want to read my Bible with others. 3. The New Testament is a whole lot simpler than we sometimes let it be. I saw this repeatedly throughout the year, but especially in our reading of Revelation this last month. We have tended to make the Bible much more complicated than it really is. I think this usually comes when we isolate small phrases or passages and neglect the big picture. I understand why that happens. We all agree on that big picture, so we focus on the patches of disagreement that we find as we read because those are the things we feel we have to iron out. Then we make those points of argument reasons for disunity and suspicion. I completely understand the aggressive desire for truth in all things, but after this year of looking at the big picture of Christian Scripture I am all the more committed to continuing to do so. With time I have found that small passages of confusion or points of contention work themselves out when we stay focused on the big picture. I know that one of Jesus’ greatest desires is for Christian unity (John 17:20-21), so I am going forward from here today with the belief that anchoring myself in the Story of God’s good news to the world, not pet doctrines or favorite passages within a denomination, has a better likelihood of creating unity. Thank you for being a part of the life of this blog. I have benefitted from your participation. Keep reading! Glory to God our Savior and Teacher! Revelation 22: Come, Lord Jesus! Here we are at the end. The last chapter of the New Testament. My last post on a reading. I will post once more tomorrow in an effort to wrap things up. Today’s chapter couldn’t be a better end. It really shouldn’t be a surprise that the greatest Author of all ended His book in such a fitting way. This is a great ending to Revelation and a great ending to the New Testament. Revelation has taken us from where we are, facing the many manifestations of evil that surround us, to a place of hope that life will soon be different. Life is held in God’s hands as the true King all all things, still Revelation has never taken away our freedom. We, the saints, must decide who we will be in this world. And it is true. Whether it was Jesus preaching from the Mount or defending himself before Pilate. Whether we stood with the crowds in Jerusalem on Pentecost as Peter preached the first sermon of the church. Whether it was the teachings of Paul, James, or John. The point was always the same: We must decide. Who will we be? With the “great city” of decadence, injustice, and immorality gone, the way is clear for a new city to come down from the heavens. Attentive readers have long noticed the connections between the Garden of Eden in Genesis 1-3 and the New Jerusalem in Revelation 21-22. Many have described Heaven (a term notably missing from these chapters) as a return to Eden. Both are places without sin where humans live in the unmediated presence of God. The Tree of Life is placed in the middle of each. A life-giving river runs from the center of each. Yes, Heaven is Eden all over again. A new Creation! What a wonderful thought! At the beginning of time the New Jerusalem existed, but it was there in the seeds of the trees, the natural resources and precious metals of the earth, the work of the hands of Man and Woman. God’s great city was already there, but not yet built. Now as God makes “all things new” God re-creates the world into what He has desired it to be since the beginning. What an amazing chapter! What captured your imagination most? What an incredible chapter! But do we see the amazing, hope-filled news of this chapter or do we , like too many Christians, miss the forest for the trees? Too often people’s views on Revelation are grouped according to the position one takes on the thousand years (or millennium) mentioned in this passage. That is a shame, because this is the only passage in the entire Bible where a thousand-year period of spiritual significance is mentioned. We are doing great injustice to this great book to make a passage that is singular and unclear at best the keystone by which we interpret the entire book. I refuse to do that here. I will not deny that this passage is enigmatic (I suspect this is a symbolic period of time as numbers in Revelation are rarely literal, and a special “resurrection” of some sort for the martyrs killed under Roman persecution, not an historical period coming to all who are alive at the time), but we need to keep the main point in view. This is the big scene in the whole drama. Everything has been building to this point. Last chapter, we saw the beast and the false prophet (the physical manifestations of evil in the life of the first recipients of this book) cast almost effortlessly into the lake of never-ending fire. Now all that stands in the way of God’s great kingdom is Satan and his henchmen Death and Hades. Satan is bound then loosed, then a military build-up takes place against God’s people almost as if to heighten the tension. But then, as quick as it started, judgment is over. God simply decrees the destruction of Evil and it is so. Maybe that is the point. God is in control. There is sound and fury, but it signifies nothing. When God decides to bring all things to an end, it is over. This is God’s world. I have to admit that much of the time that is not how I see it. And I would imagine the original readers of Revelation struggled to see it that way too. But that is the incredible good news of Revelation: Even when it is hard to believe it, God is truly in control of all things. We are on the winning side. I was fortunate that both of my sets of grandparents lived in the same small town, a few hours away from my childhood home. Every Christmas included a visit with both sides of the family in a grand two- or three-day holiday. The celebrations with each family couldn’t be more different. Christmas with my mother’s family was loud with laughter and stories. There was always an endless game of road hockey, and some of the best cooking you ever would have. I enjoyed our Christmas visits with my dad’s family just as much but the traditions were very different. My grandfather would hold court in his living room around a warm fire, where all were invited to solve the world’s problems with appropriately conservative answers. We children would escape to the basement to shoot pool until we grew old enough to have opinions we could support. To this day, though, what I remember most was that my grandfather always had classical music playing. Royal Canadian Brass. The Boston Pops. Handel’s “Messiah.” When my grandfather passed away last year I was given a nut-bowl I had turned him in the seventh grade in woodshop, and a collection of CDs he used to play at Christmas. Amidst the oracles of doom and judgement, the grotesque beast and powerful celestial beings, it is immensely fitting that the fall of Rome ends with the flourish of praise to Christ the Victor we find running throughout this passage. What a great gift for Christmas! Fair weather friends. Here today, gone tomorrow. It turns out that’s all Rome’s friends were to her. Judgment has come to this wicked woman who thought no harm would come to her, that no one would hold her accountable for her behavior, even the buying and selling of humans (18:13). But she will be paid back double (18:6). To be sure, Rome’s fall is lamented. But not for the reasons we might expect. “Alas, alas,” they said, “the great city! Everyone who had ships on the sea could get rich from her wealth, but in a single hour she has become a desert.” (18:19). The merchants and mariners who cry over Rome’s demise are really crying for themselves. They care about only to the degree it affects them. They are broken up over their loss of business. Not exactly compassion now, is it? Power intimidates. Power can produce great respect. Power might even engender admiration. But power is not the recipe for loyalty, sacrificial kinship, or even love. When power wanes, so too do the alliances that power brought. Rome only knew how to operate by power. The kingdom of the Lamb is the dominion of love. Tonight is Christmas Eve. My family has made a bunch to trips to Target and Sam’s Club and the grocery store the past few days. I am thankful those businesses exist. As much driving as many of us do around the holidays, I am glad the big oil companies exist. I look forward to sitting down tonight in peace and order and even a reasonable level of affluence, and I know that I have the sacrifices of soldiers and the tireless hours of civil servants to thank. But when I sit down tonight it will be with my family whom I love. Maybe my family of faith too at a nearby Christmas Eve service. Tomorrow my family will enjoy each other’s presence and we will make time to celebrate the birth of the Lamb. Love breeds love, not power. Revelation 17: Babylon the Great, Mother of Whores! When an event like the tragedy in Newtown, CT takes places, it is common that in the news the same event is replayed from lots of different perspectives. That is the best way to view this section of Revelation as well. Rather than understanding chapters 16-19 chronologically, we are seeing the same fall of Rome from several viewpoints. Today, John sees Rome (code-named Babylon) pictured as a gaudy, drunken prostitute riding on a red, seven-headed, ten-horned beast. She is drunk on the “blood of God’s holy people” (17:6). Rome is pictured here as a power-drunk manipulator of the nations, offering base pleasure, riding on the beast of brute power. So pictured, we can all think of many such prostitutes throughout the ages. Interestingly, when we talk about two powers — political, cultural, or economic — joining forces in order to increase their market share, we say they are “in bed” with each other. The seven heads symbolize both seven hills (just like Rome was built on) and seven emperors of Rome, much as they did on the seven-headed beast in Romans 13. The most salient point regarding the heads/emperors of the beast is that there will soon come an eighth head/emperor who “is also one of the seven” (17:11). This strange statement is best understood as a reference to the soon-to-ascend destructive Domitian, who will be like Nero returning from the dead. The ten horns are foreign puppet-kings that join the prostitute in her persecution of the Lamb. In a strange twist of events, as the chapter ends the ten horns and the beast turn against the prostitute, destroying her with fire and eating her flesh. These ten kings will eventually revolt and overtake Rome. The prostitute discovers what many have found throughout the ages: “every revolutionary power contains within itself the seed of destruction” (Mounce, Revelation, 320 quoting Lilje). In opening the door of alliance, Rome also opened the door to defeat. Power attracts, but them it corrupts and turns people against each other. Power is Rome’s downfall. With all this talk of Satan, it would be easy to think dualistically as if God and Satan are fighting each other with near equal power, heading towards an uncertain end. John remind us all that God is sovereign and all that is done comes by His hand. God is ultimately responsible for Rome’s fall. I know, it is the eve of Mayan Apocalypse. No, this post is not about that. We have come to the end, at least for Rome. But unlike the Egyptians, many who softened and begged Pharaoh to relent, the average Roman remains hardened, cursing God and refusing to repent. In the first two sets of seven, we had an interlude between the sixth and seventh bowl or trumpet which was spoken to the saints directly intending to bring hope. We have an interlude here, but only for the triumvirate of evil (dragon, beast, and false prophet, 16:13) to gather forces to enter battle from forces marching from the east across the “dried up” Euphrates. The march to the bloody end continues, and will do so for three more chapters in a grand mix of images. The term “Armageddon” is a Hebrew derivative and comes from 16:16 where Wright follows several translations and calls the site of the last battle “Mount Megiddo.” That translation is not unanimous, in fact, this passage is a hotly contested one. Is this referring to the city of Megiddo in northern Israel? Is this referring to a mountain (that Megiddo did not have)? Is this being used symbolically (which I suspect), as Megiddo had been the site of many pivotal battles between nations from that area of the world? We run the risk of getting too caught up in specific details. The fact that East meets West in Israel (some say) in this vision is why people inclined towards latter-day prophecy see some final battle involving the modern state of Israel and tension in the Middle East, especially Iran now (though, wasn’t it Iraq ten years ago?). Mix religion with American foreign political policy and you can see how this gets messy in a hurry. Back to the Bible: today, it all ends with the seventh bowl, where a divine voice says “It is done!” (16:17) — an echo of the cross? — and the great city (Rome, presumably) both falls in an unparalleled earthquake and is crushed by gigantic hailstones. I am struck by how the people of the great city have become so depraved that God’s punishment has only caused them to become more set against God and resistant to repentance. But after the evil we have seem in Newtown, Connecticut and various other places recently, I shouldn’t be surprised. What made you wonder in this chapter? Today’s short chapter is largely a preparatory one. Seven angels come forward to the heavenly temple to receive bowls filled with the final acts of judgment from God. These will be poured out in the next chapter. Also in the scene is a collection of people standing beside a glassy sea. What strikes me is that this group are those who have won. But remember this is a heavenly scene. They have won but they won by dying. Death is what brought them victory. Being willing to die is how they won. The battle was for their souls. Would they give up their integrity and faith to stay alive through compromise or would they show the forces of evil that God has greater power over their souls than that. Every time a person is willing to suffer rather than give in to compromise another victory is won for the Lamb. The conflict in John’s visions lets up for a moment, and now things are about to get loud! John has a new vision, this time of the Lamb and the 144,00 marked on their foreheads for rescue and reward. Standing on Mount Zion in the ideal city of God safely away from the pressing of the grapes of God’s wrath outside of the city (14:20). So the praise erupts. A thunderous, cascade of harps and a new song just for the moment. Who wouldn’t want to be a part of this scene? How does one ensure he will be there (14:4-5)? These qualities would have been especially poignant for the original recipients of this book. Life in the Roman Empire where they were being progressively pushed towards life-and-death decisions made them daily have to determine whether they were willing to remain unspotted like the 144,000 of this vision (maybe recent Christian martyrs like Antipas who had been faithful unto death, 2:14?). A little lie about their beliefs could save them some harassment. Avoiding oppression through participation in the religious cults of the Empire and the trade guilds (unions) of their towns would also place them into sexually immoral situations, for sure. Were they ready to follow Jesus’ example of holiness even to the point of sacrifice? Many of us are not in the same immediate threat of physical harm and economic marginalization because of our faith. But the pull to engage in a culture that is far too sexual and dishonest is still very real. One can stand out too much in business and culture. One can be too religious, right? The call to faithfulness is one we need to hear too. Remembering that apocalyptic literature is stated in code, Babylon is certainly a reference to Rome. As Babylon was the immoral and barbarous nemesis of the people of God in the last part of the Old Testament, likewise Rome is to the nascent Church. The trouble is that Rome had not fallen. In fact, when John is writing this Rome is a great height of power. She still has the ability to make her mark on these Christians (14:9) and to kill. Maybe the point is that to live faithfully in the midst of hard times requires end-time vision. We must remain focused on how things end, not how they are right now. We must bear in mind where each of the forks in the road leads in the end, not what they look like right now. The Rome of our lives have fallen. They are fading away. The Lamb will win in the end. A new city is coming where the harvest is gathered in for abundant living (14:14-16). That was certainly one of the reasons for this whole book: the give end-time vision to a persecuted people so as to strengthen their resistance. Often, we need that encouragement too. At church each week I sit a row or two in front of a former POW from the Vietnamese War. Ken is an immensely interesting man, both distinguished and completely humble at the same time. I have heard him tell his stories several times of being detained in the Hanoi Hilton and every time the crowd — whether they were age 8 or 80 — was mesmerized. Especially intriguing was his account of writing letters home to his wife. However, these letters were filled with intelligence details written in seemingly innocuous code he had been taught in training for the war. The Viet Cong would read his mail and pass it along as nothing more than a letter to a wife about remembrances from life at home or purely imaginative scenarios. Hidden in there were details about how many detainees were there, their conditions, morale, and the sort. Revelation 13 was the first chapter I ever read in Revelation. I was 14 and I had heard of this chapter about weird monsters and the number 666. Sounded like the kind of chapter a kid who listen to Iron Maiden and Black Sabbath and who read Stephen King needed to read. So I did. And understood nothing that I read. You may feel the same way today after reading this chapter. Weird. Puzzling. I think it is best to think of this chapter like a letter to a detainee’s loved ones that might seem odd but innocuous to the outsider but had much meaning to those familiar with Jewish apocalyptic imagery and rhetorical devices. How do you talk about the enemy when they read your mail? Like this. As chapter 12 ended we left the seven-headed red dragon Satan as he flooded the earth with waters of evil in an unsuccessful effort to drown the woman who gave birth to Jesus. Today, out of that sea (a universal symbol in the ancient world of evil) comes a horrific beast. With seven heads and the watery connection, we know this beast is a servant of Satan. In the last half of the chapter, another beast arises from the earth who serves and glorifies the first beast. On what is surely a take-off on the sealing of the righteous in chapter 7, this second beast marks on the right hand and forehead all of those in the area who wish to do business. Finally, John says that this beast is a symbol for a human and using apocalyptic numerology (gematria) one can determine who this is from his secret number 666. Yeah, clear as day, right? Much ink has been spilled on this confusing chapter, and I don’t wish to add to it other than to give an interpretation that I think makes sense (the Internet is filled with scores of other interpretations). After pulling back the curtain of reality in chapter 12 to show us that Satan is really behind the suffering of the Seven Churches of Asia Minor, John lets the curtain back into place so all we see again are the human agents of Satan’s work of deceit and destruction. There is a horrible beast of a power that will make the life of the Christians of Asia Minor difficult. That beast will come by sea. This is most likely the Roman government as a whole, with seven heads for the seven emperors there had been before this time, the mortally wounded one being the worst of all thus far, Nero. Then, as the second beast is especially religious (13:15) the beast from the land is likely the government officials and religious personnel from Asia Minor who were especially loyal to Rome and would have put the greatest direct pressure on the recipients of this letter. We know that greatest ostracizing and disenfranchising tool that natives would have had was the ability to turn people against a Christian’s business. If you want money bearing the “mark of the beast” (the picture of the Caesar) you will have to play by our rules and leave your superstitions behind. These Christians knew well the power of this beast. The symbolic number 666 has been interpreted many ways, but the best seems to be that this is a reference to Nero, based on a popular belief that Nero was so evil he was going to come back to life again (the Nero redivivus myth). In a sense, Domitian, who brought intense persecution to the Christians of Asia Minor shortly after Revelation was written (if a date in the 80s AD is correct), became that “second Nero.” Domitian picked up where Nero left off. In an effort to universalize this maybe we could say that the beast from the sea is any force that uses sheer power to work against God’s kingdom. The beast from the land is the force that adds religion by coercion and intimidation into the mix. That happened in the first-century Roman Empire, the tenth-century Roman Catholic Church, the twelfth-century Islamic Middle East, the early-twentieth century Nazi Germany, the mid-twentieth century Iron Curtain Communists, the twenty-first century terrorist camps in Afghanistan, and now the center of Africa as tribe battles tribe and ethnic group kills off ethnic group. Brute Power and Religion used to support Brute Power has had many faces throughout history. When one sees the immense power of these beasts, it is hard to imagine that anyone could resist doing what they want. And in the ancient Roman society, most did follow the norm. But these Christians can take heart that they have an allegiance to one who is even more powerful. They can be those who will not bow a knee. That too is this group of faithful Christians. And now we are back to what has become one of the paradoxical main themes of this book: There is a great rescue coming. Hold on. You will be taken safely through it if you do not give up the faith. But that rescue is not physical. You will have to lay this life down and go through the second death in order to live forever with the Lamb. What do you think of this mysterious chapter? Turning points. We love them. Or hate them, depending on which way things turn. When things start turning in a favorable way, they are the dawning light of a new day. They possess hope enough to fight on. D-Day was one such turning point. Thursday, June 6, 1944. Tides turned for the Allied Forces on that day. That Hitler and the Axis Powers had gone from the hunters to the hunted was becoming clear. However, there was still fighting to be done. V-E Day would not be for another eleven months, Wednesday, May 8, 1945. In many ways I read this chapter, seemingly the contents of the bittersweet “little scroll” of chapter 10, as a similar turning point. John receives a vision of two witnesses guarded safely through a period of persecution (42 months = 1260 days = 3.5 years = time, times, half a time → were all symbolic ways to depict an indefinite period of trial, based on Daniel 8). However, when that time period is over and their message has been faithfully delivered, protection is lifted and the people of the “great city” of “Sodom” or “Egypt” kill them and leave them for public disgrace. After 3.5 days, the two are resurrected and whisked away to the heavens. At this point the angelic chorus of God’s throne-room breaks into unmatched praise and announcement of a decisive turning point. Now is the time “to destroy the destroyers of the earth” (11:18). Who exactly are the “two witnesses”? There are many, many interpretations. This may be one of the most contested passages in the book. 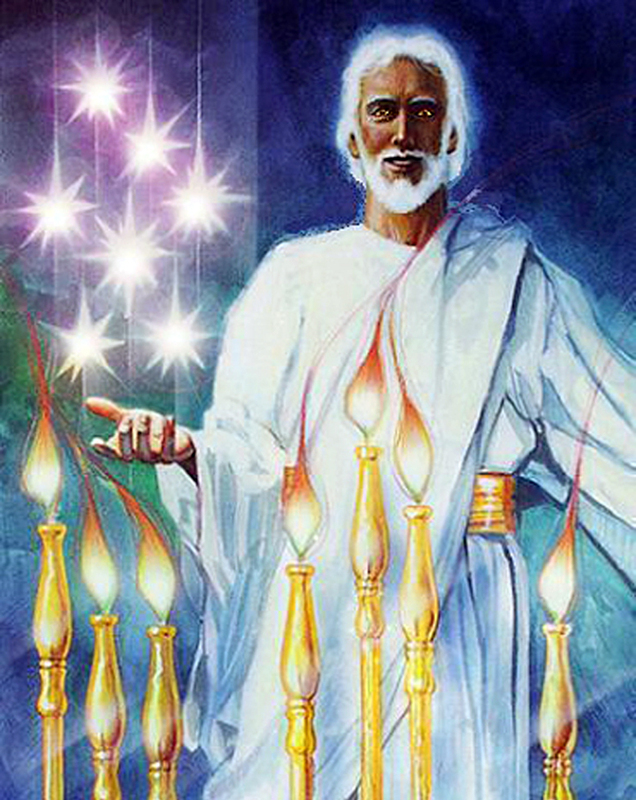 Almost all see that the two witnesses are described as Elijah (fire devouring enemies, shut up the sky from raining, v.5-6) and Moses (water turned to blood, calling down plagues, v.6), but who or what is being referred to by these figures? If this vision is talking about actual people, I am most drawn to the suggestion that this would be Peter and Paul, both of whom died during the reign of Nero in public ways in Rome (always the “great city” in Revelation, and understandably like the immoral Sodom and tyrannical Egypt, v.8). Now, fifteen years later, the Jesus movement did not in fact die as one might have expected it to after the persecutions of Nero. Almost as if it were “back from the dead,” as strong as ever before, the tables have turned. There are dark days ahead for the seven churches addressed in this book as Domitian brings a second wave of persecution in Asia Minor, but God will see them safely through this as he did before, at least safely through the second death of martyrdom to the great reward of new life. Rome dealt its death-blow to those brought to Christ by the apostle to the Jews (Peter) and the apostle to the Gentiles (Paul), but death could not keep her down. The fate of the kingdoms of the world is sealed at this point. Victory is in sight. Rome is going down. Rome is now the hunted. Justice is coming. In many ways, what we will see as we keep on reading will be the undoing of the forces of evil opposed to God. There is nothing that God is after more than the redemption of His creation — people and place. This is the New Creation, when this world is rescued from the forces of evil and it becomes the domain of God once again. Here in the middle of the book we are given a glimmer of the glory to come. Back in the sequence of the seven seals we came to an interlude between the sixth seal and the seventh that spoke encouragingly of the sealed 144,000 and the numberless masses. Today we come to another interlude at the same point in this new sequence of seven trumpets. This break in the action of judgment is also intended to be a message to the Christians directly, but this time about their responsibility as witnesses. A giant angel holds a small, opened scroll in his hand. John is told to take this scroll and eat it, and he does. Then John is told the prophecies of punishment on the evil of the world will continue. A logical conclusion is that this scroll contains the visions of Revelation 10 and 11, revelations that must be given to the Christians directly before we can return to the seventh trumpet at the end of chapter 11. The detail that caught my attention is that the scroll tastes sweet but then it turns the stomach sour. That God will see the faithful through these horrible days of judgment is sweet indeed. They can rest assured of the protection their seal affords. Yet, the message of chapter 11 will remind them that they must first suffer. They are not saved from death, they are victorious through death. The immediate, emotional realization of this fact will turn their stomach. We are again reminded that while Revelation is definitely a book of hope and good news, it does not promise a pain-free, comfortable ride through the choppy waters of persecution. One has to take up his cross before receiving a crown. When have you experienced the bittersweet nature of divine revelation before? With today’s reading we are solidly in the section of Revelation that is both hard to understand in a simple reading and that reveals aspects of God that we neither think a lot about nor welcome. After running quickly through the first four trumpets, John concentrates his attention on the fifth and sixth. As the revelation unfolds we see an army of lion-toothed locusts armed like scorpions come up out of the underworld to invade the world bringing torment as they go. With the sixth trumpet this only intensifies as a numberless horde of long-haired barbarians wreaks havoc on the countryside (bear in mind that the barbarians of northern Europe did in fact bring the end to the Roman Empire in the 400s AD). More than torment, this army of riders brings death to a wide swath of people. As a great fan of Tolkien, I can’t help but imagine an army of demented and distorted orcs marching across the land. Notice the faithful who have been marked on their foreheads by God as His are protected entirely from the effects of the trumpets (9:4). John now has God unleashing evil forces to punish the wicked. Maybe we are uncomfortable with this idea of God using evil, but here it is. Sadly, I have to believe that there are people alive today who are every bit as depraved as these. My son has one of your typical microscopes that has three lenses that rotate, through which you can view a slide with gradual degrees of magnification. At first you can look through the 10x lens and see a small insect or piece of a plant or a seed in its entirety. Then you can switch to the 40x lens and finer features begin to reveal themselves, until with the 100x lens you see the finest of details you did not know even existed. You are always looking at the same thing, but your ability to see the details grows as the lenses change. Today we come to the second set of seven objects that deliver judgment on the world. First it was seven seals. Now it is seven trumpets, an object used universally in the ancient world to announce battle. In a few more chapters we will come to seven bowls from which God’s wrath is poured. Thinking as good westerners for whom all time is linear, we naturally think these three sets of seven are occurring chronologically one after another. That is twenty-one doses of some bad medicine! Robert Mounce, a respected commentator on Revelation, argues that it is better to think that these three sets discuss the same events just with more and more detail as we move through the sets, as happens with my son’s microscope. The seven seals largely described the woes of the world as socially-occurring events brought on my human selfishness: war, violence, maybe even famine and disease. Now as the details of the matter come into focus with the trumpets we see that there is a divine hand involved in the judgment. This way of thinks of the seals, trumpets and bowls is worth considering as we read. I also want to point out why God is unleashing divine judgment. Much like the events of fifth seal in which we were allowed to see the faithful but persecuted Christians crying out for justice, the prayers of the righteous have come up to God in His glorious throne-room like incense and he is aware. The prayers of people precious to God are powerful. God sees their plight. He hears their prayers. He smells the desperate aroma of their lament. God does not stand by aloof. What hit you in a new way in this chapter? Six seals down and we are all expecting the seventh seal next. We know only more woe will come. Before that seal is broken an angel rushes in to plead that God’s people be marked on their foreheads (a visible place that one sees immediately when meeting a person) lest they be caught up in the judgment to come. We think of the blood on the door frames of the houses of the Hebrew slaves in Egypt during the Exodus. One hundred and forty-four thousand people from the twelve Jewish tribes are marked. As 12 and 1000 are both numbers in ancient numerology that connote completeness, the point is not a literal number but that God’s plan has reached completion. Lest we think this vision only favors the Jews, next we see a countless number of people from “every nation and tribe and people and language” (7:9) gather before the throne of God dressed in white robes, praising God and waving palm branches. The New Creation will be a place for all people, not just the chosen people. Not just people like us. Presently, there is once again an anti-immigrant sentiment sweeping through Europe, not unlike what was present in the 1930s and at various points before, though not to that degree and wide acceptance (remember that mass shooting at a summer camp in Norway a year ago?). Sadly, these same feelings are becoming more and more prevalent in America as well, even in our churches. Socially, this concerns me for what’s coming. Spiritually, this cultural enculturation saddens and sickens me. God’s Kingdom is the place where color, language, citizenship, and customs neither matter nor separate because there is a more important commonality in the blood of the Christ that trumps all of these. There is no place for racism, suspicion, and cultural superiority in the Body of Christ. There is suffering to come, but then there are blessed days ahead in the New Creation. What caught your eye today? Yesterday we were introduced to the scroll of destiny. Today the lamb begins to open the seals one by one. As each seal is broken some monumental event takes place. The first four seals launch a horseman — yes, the “Four Horsemen of the Apocalypse.” Off they go on white, red, black and pale horses bringing death in various ways as they go. Whether battle, disease, famine, or even wild animals, when the time comes for the seals to be broken Death personified will ride into the lives of those who have oppressed God’s people. If we look at the history of the Roman Empire in the three hundred years after John’s vision, that is exactly what we see happen. And so often since then, we have seen Death have his way with the godless regimes of human history. But why is this happening? We might wonder. Some may bristle at passages like this one. There is no escaping that in this passage God is orchestrating the death of at least the fourth of the world’s population (6:8), if we are to take that number literally. Some might object that this sort of action is beneath God. But this is not just violence for violence sake. God doesn’t go on a tear for no reason at all. Here we get a stark look at the justice of God. We must remember that justice is on the other side of the coin from the forgiveness and mercy we like to focus on. When people are seeking forgiveness, the good news is that it is available. But when there are powers afoot that desire only their own will and have no regard for God or moral living, good news for those oppressed can only be the punishment of the tyrants of this world. Some who read Revelation are turned off because of its violence. This is a picture of God they deem unbecoming. However, as anyone who has ever been persecuted for their faith can tell us, there are some situations in life where justice is the only way to rectify a situation. To not bring evil to an end would, in fact, be unjust and erode the very fabric of life. Revelation is dark in many places, but always in vindication of the faithful who have suffered even unto death. The times, they are a-changin’. The balance is shifting. Revelation 5: Worthy is the Lamb! God is on His throne in magnificent light. He is at the center of all things. He is given the praise that is due him from the twenty-four elders, a symbol of all of God’s people signified by the 12 tribes of Israel and the 12 apostles of the Church. The powerful beasts bow before him. If this is a concert or a show, the house is pumpin’ now. There is lots of energy. The stage lights are high and hot, and we the masses are in the dark watching this unfold. The hall is loud as those gathered on stage pour all of their spirit into praising God. Then someone new is introduced and, though it is hard to imagine, the scene erupts with even more praise. The volume increases. The back lights of the stage light up to reveal a chorus of angels more than can be numbered that join the elders in praise. The strings of harps fill the air with melodious sound, and the air is rich with the smell of incense. The Lamb has just stepped into the circle of praise. But in a poignant bit of irony, the Lion has become the Lamb. Let there be no mistake, the Lamb is powerful like a lion, but his work up until now has always been more like a lamb. One must be a lamb before they can be a lion. As the Lamb strides up to the throne to take the sealed scroll from God, song after song of praise is sung in his honor. Sometimes the best thing to do in life is just to stop and praise before the moment gets away. We do not yet know what is on this scroll, though we can see that it has writing on both the front and back indicating this is a full message. We can tell from the seven seals that the writer of this scroll wants to keep its contents well guarded. John was told at the beginning of chapter 4 that he would be shown what would be coming in the future (4:1), so we assume this scroll contains the future destiny of someone or even the whole world. As the Lamb comes into the light emanating from God we see it possesses all power (horns) and wisdom (eyes) but that it also has the wounds of death on it. As surreal as it seems, the Lamb has died and is now alive again. In fact, this is precisely what has made the Lamb worthy to take the scroll. If it were only power that made one deserving, maybe one of the four creatures could have done it. It was the Lamb who “won the victory” by being “slaughtered” (5:5, 9). A people were purchased for God “with [his] own blood” (5:9). The Lamb is “now” deserving because it has been “slaughtered” (5:12). The Lamb is worthy because it has died. This is a big theme in the book of Revelation. Suffering comes before praise. Power is purchased with blood. The way to overcome is by laying down one’s life. Victory comes through sacrifice, not battle. We will see this idea come back often this month. The recipients of this book needed to hear this. And we do too. What element of this chapter really captured your imagination? Revelation 4: Who Is Really Seated on the Throne? Like all the great prophets of the Bible, one of the first visions John receives is one of God. Jesus, who can open all doors (3:7), opens the door of heaven and ushers John into the throne-room of the Lord Almighty. This is the point where I think words are insufficient to express the reality, but John keeps on writing. I can only imagine that the reality will be even better than this amazing chapter! There are always those inevitable days when other forces loom on the horizon as god-like. For the Christians of Asia Minor that force was Roma — the personified power of Rome, a military, cultural, and economic superpower. At times like this we may know in our head that God is unparalleled even by this force before us, but our hearts and souls sometimes need reminders. This is when we most need a full-senses reminder of who is really the god of this world. Maybe that comes in study or worship or service. For John it came in this vision. How could he face all that is to come in this book without first seeing this majestic vision of God? I am drawn to the four grotesque creatures that surround the brilliant throne of God. Each in a different way signifies great power. An ox was the John Deere tractor of the ancient world. How can agriculture be successful without a good team of oxen? The skies are dominated by the eagle. With its sharp talons, keen eyesight, and fast speed prey can only hope to run for cover. The lion was and to some degree still is the universal symbol for strength. The ancient Assyrians marched out to battle with lions on their shields. Today we call the lion the king of the jungle. But what can out-power all three of these? A human, well armed and skilled for the hunt. Standing at the top of the food chain is a well-muscled, intelligent human. And yet all of these great symbols of power praise the “Lord God Almighty” (4:8). With their many eyes these creatures see all things. They know who is most worthy of honor. Still they praise God. Nothing escapes their attention; they are always alert, never sleeping. Still they praise God. Who else is worthy of such praise? What caused your heart to sail in today’s reading? Promises. We all get a lot of them. Promises are only as good as the one making the promise. Making promises isn’t the same as wishful thinking. To give a good promise you must have the ability to deliver on that promise. In each of the letters to the seven churches of Asia Minor in Revelation 2-3, Jesus makes a promise to bring something — good or bad — to someone because of what they have done or not done. In every case, Jesus makes it clear he possesses what is necessary to fulfill his promise. We don’t just serve a God of wishful thinking. Jesus doesn’t just hope he can help us. We aren’t just crossing our fingers and wishing on a star. Our God makes promises, and He possesses all that is necessary to fulfill those promises. Live in the world, but do not become like the world. That is the calling of a Christian, and a formulation we have probably all heard all of our lives. (Did you know that phrase is not actually in the Bible? The concept certainly is.) We are called to be involved in the lives of non-Christians, not a detached group that vilifies, hates, and avoids those not like us. We are called to shape the culture in which we live for the sake of Christ. At the same time we are called to remain unspotted from the filth of this world. We are not to become so like our non-Christian neighbors that we are shaped by their culture. That is a challenging balance to maintain! In Revelation 2-3, John addresses the seven churches of Asia, each in turn, in what are most like little “letters” to each. A common theme running throughout these interesting sections is the way in which each church has interacted with the pagan, sinful culture in which they live. Life in the first-century Roman Empire required one to worship the pagan gods and the Emperor. Most of the publicly available meat came from sacrifices offered to pagan gods. Business required a person to be a part of a trade guild (like a union) that had a patron god. Public life was immensely immoral, especially sexually immoral. Like any large economy, it was important to turn a buck, one way or another. How do you live as a follower of Christ in such an environment? Remember, the recipients of Revelation were persecuted Christians, targeted because they were identifiably different from their neighbors. An easy way to avoid that persecution, though, is to lessen the degree to which you stand out as different. A little cultural accommodation never killed anyone, right? Maybe it might even keep you alive to share the gospel another day. Jesus, who is in their midst (1:12), has seen their lives and has a message for each, usually focused on the way that church has chosen to live in their non-Christian society. For ease of discussion I am including a chart that places each of the seven churches (and two other groups) on a continuum according to how they chose to interact with their culture (click on the graphic to enlarge and print from this PDF). As you read through the “letters” to the seven churches, see if you can tell why I have placed them where I have. There was a group in the churches of Asia Minor who were extreme accommodationists. The Nicolaitans seemed to believe (like the Gnostics) that a Christian showed his superior spiritual strength by engaging in all the sinful practices of pagan life but without that affecting his soul. The followers of “Balaam” (2:14) and “Jezebel” (2:20) — surely, two code names — were likely Nicolaitans. It appears that this sort of thinking had been influential to various degrees in the churches of Thyatira and Pergamum. The Laodiceans had developed the same sort of arrogance those in their city had who have become rich and self-sufficient (3:17). Given that the Christians in Sardis were not suffering any persecution at all, it would appear they had chosen not to stand out from society in any great way. Jesus scolds these churches for their compromise of doctrine, purity, and zeal. At the other extreme would have been Christians who were on guard against this sort of cultural accommodation to such a degree that they isolated themselves from society, becoming judgmental and unwelcoming to outsiders. While immensely pure, they also lacked the love for others that God so desired His people to have. The Pharisees (literally the “set-apart ones”) would have the best known example of this mentality, though they were not Christians. Of the seven churches of Asia Minor, the church in Ephesus was most known for this lack of love, and thus Jesus highlighted this compromise of attitude (2:4). Only the churches at Smyrna and Philadelphia escape any criticism at all from Jesus. These centrist churches seemed to recognize their role as shapers of culture and were doing so admirably, even if that did mean that both of them would have to sacrifice their own comfort to do so. Of course, this same continuum can be used to describe churches at any time in history and any place on the globe. God’s kingdom in always an alternative community, different from the cultural norm. He calls us to be the “kingdom of priests” (1:6) who stand in the gap as mediators with one hand on God and one hand in the world. Jesus figures significantly in this first chapter of Revelation. There should be no wonder; this is the “revelation of Jesus Christ” as verse one tells us. Now, stop for a moment. Think how provocative that flourish of praise is. John is ascribing a power to Jesus that is equal or even surpasses the Caesar. Is this god of the Christians more powerful than the Caesar who rules all other regional kings of the Mediterranean? What a dangerous way to start a book to people persecuted for their seditious beliefs! Lest there be a misunderstanding, this is a different kind of king. Yes, he has conquered kingdoms. He holds in his hands trophies of powers that have been vanquished. Jesus is not a king like Caesar. He certainly desires the hearts of those who address him as king, but he is not seeking more soil and greater riches. He has conquered a power greater than Caesar himself. His greatest victories are spiritual. As we start this book, it is important for us to note where Jesus is in this vision. He stands in the midst of seven lampstands, which verse 20 tells us signify the seven churches to whom this book is written. Thus, as we start this book we see Jesus standing in the midst of his suffering people. Jesus is a mighty king but also a compassionate comforter. What stood out to you in this chapter? Recently, a friend and mentor said he and his co-teacher had taught every book in the New Testament in their Sunday School class . . . except Revelation. It is just too hard a book to teach responsibly. True! I am afraid this sentiment is true for many Christians too. They avoid Revelation out of fear, confusion, or intimidation. Some so neglect the book they don’t even realize the book is called Revelation (singular), not Revelations (plural). But many of us also know people who hang out in Revelation to the exclusion of much of the rest of the New Testament. Every news headline is a fulfillment of some obscure detail in Revelation. This two-thousand year old book was certainly talking about the European Union or Barack Obama or Pope Benedict. Making sure people know and agree with these interpretations of prophecy is equally as important as how one treats his neighbor or whether care is given to the destitute. Whether one avoids the book or camps out in its pages, Revelation is an absolutely incredible piece of literature and fitting end to the Bible. Personally, once I took a seminary class on the book my confusion over the book was far less. Now, Revelation is easily in my top five favorite books of the Bible. More and more I see how the teachings of this book have become integral to my own theology. 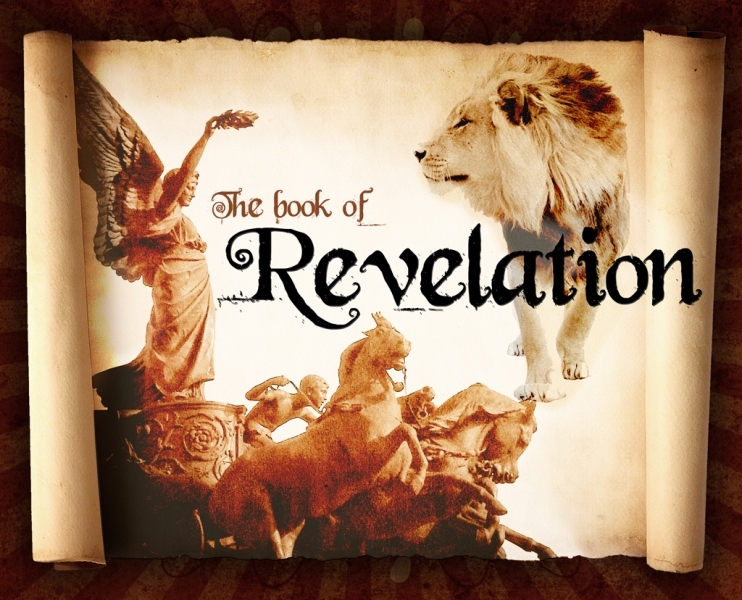 There is no way these short posts will help us all overcome our under- or overemphasis on Revelation, but may the last month of this blog help us all gain a new appreciation for this majestic book. Revelation was written by a man named John. But which John? The apostle and writer of the Gospel and Epistles? Probably not. There is too many stylistic and theological differences to suggest these were all written by the same author. Many scholars are content to simple say this is a different John, maybe “John the Revelator,” writing from exile on the island of Patmos just off the coast of Asia Minor near Ephesus. When was Revelation written is also somewhat contested and a question that many scholars believe can be answered very precisely because of cryptic references in the book. What most agree on is that the book was written during a period when Christians were being persecuted and therefore had to speak in code. This would fit the time period of Nero in the 60s AD when Peter and Paul are traditionally thought to have been killed, but an even better case can be made that this fits the 80s when the Roman Emperor Domitian brought about an even bloodier oppression of Christianity. I tend toward a later date. What kind of book is this? Prophecy? Yes, there is certainly prophecy in the book. A letter? We know from the first three chapters that this book was addressed to the seven churches in Asia Minor (where the persecution of Christians in the 80s AD was worst). Revelation is sermonic and poetic in places, and maybe the best term for the book is apocalyptic, in that it is giving a message veiled in exaggerated, fantastical imagery because of perceived opposition to free speech. Bottomline: Revelation is good literature. Then — John was addressing people in the first-century undergoing first-century problems, mainly political and cultural persecution. The main evil in the book is Rome. The grotesque beasts are emperors and political/economic institutions. Maybe the last three chapters are talking about the end of time, but the rest of the book has to stay anchored in an ancient Roman context. Future — John was foreseeing cataclysmic events that would take place at the end of time as Jesus returns and the New Creation comes. Of course, the beginning of the end could be right now, which is what many people have thought all throughout time since the first-century. So look for the “signs of the times” all around you. Always — John was speaking in symbols and by nature symbolism is much more timeless and malleable to situation. We press the images too far when we come up with singular, specific, time-bound fulfillments. John is speaking of evil in its many faces and forms, all throughout time. Thus, John is talking about Rome but also our world today and the Middle Ages and the age to come. This month we may not break the code on whether Sandy and Katrina, economic cliffs, and re-elections are harbingers on the end-times. But if we keep our eyes wide open to the big picture I believe we will be encouraged by John’s main point: Do not be discouraged by the darkness you see all around you, God wins in the end! Better days are coming! Praise the Lamb who has made the victory sure!